"What a beautiful fish did you catch it yourself?" "Yeah I caught it on the side of the road." Or so goes the local joke. 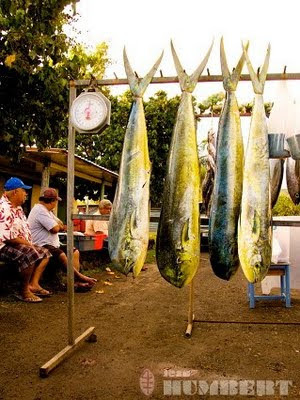 People who come to Tahiti for the first time often scoff at the fish being sold along the roadside. They turn up their noses at the supposed flies and the high outdoor temperatures that are surely making it rot on fast forward. But locals know better. Roadside fish is fisherman direct, rarely more than a half-day old and costs a fraction of what you pay at the supermarket (where the fish is usually around three days old and has probably seen many more flies). A giant slab of sashimi quality tuna that can generously feed four people costs 1000 CFP (about US $12) and most of what's for sale is bought up by hungry locals within a few hours. On good days you'll find glimmering gold and blue mahi mahi, octopus, ume (unicorn fish) and of course lots and lots of tuna. The strings of small lagoon fish usually have been shipped from the Tuamotus and these are the exception to the rule - they are possibly a week old (or more) and often rotten. I have never figured out how they keep up the market for these sorry looking fish - everyone I know who has bought them swears to never do it again. Luckily for me, I'm married to a fishing fanatic so I get free lagoon fish direct from the lagoon to the table a couple times a week. When we have company though, or when Josh has been too busy to fish, I head to the side of the road and dangle my 1000 CFP bill for some tuna to make the local raw fish favorites: sashimi, poisson cru or carpaccio.